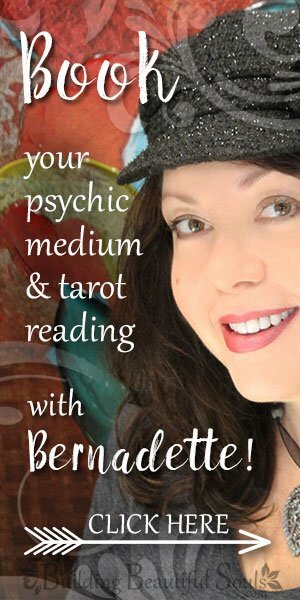 Life is what you make it, and according to the Eight of Pentacles tarot card you are turning it into a work of art! Astrologically, the Eight of Pentacles is associated with the Sun in Virgo. The energies in this card are all about setting goals, paying attention to detail, and finding ways to improve any situation. Oh, and they’re also about rolling up your sleeves and getting to work. Whatever turmoil may have rocked you in the past certainly doesn’t show now. You are settling into a rhythm that’s both comfortable and productive. 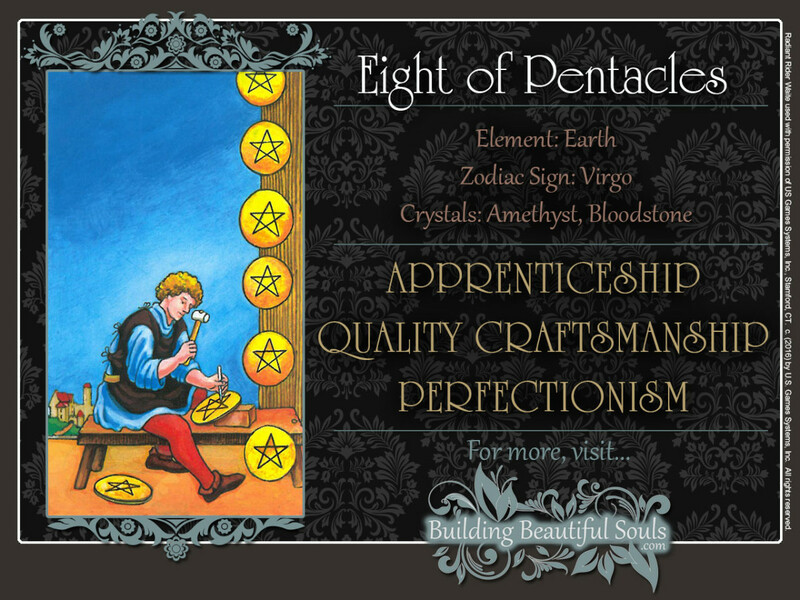 In the Eight of Pentacles tarot card, the artist’s black apron shows that you have learned a lot about life. In the Four of Pentacles, that apron was a cloak symbolizing your obsession with material things. In the Five, that cloak blew up into a major existential crisis. It engulfed you like a raging blizzard at night. Now in the Eight of Pentacles card, it has changed into a sense of responsibility that keeps you from goofing off too much. Underneath the apron, the artist in the Eight of Pentacles is wearing blue and red. His work is an act of love. The pentacles he is displaying on the wooden pillar and the castle in the background of the Eight of Pentacles show that his work his work also giving him the comfort and stability he desires. The pillar is on the right side of the Eight of Pentacles tarot card and the castle on the left. This means that he is using his intuition to guide him without ignoring the rational, logical aspect of his mind. They also show that he’s very proud of what he has accomplished. Aren’t you proud of what you have done? You should be. The content, but focused expression on the artist’s face in the Eight of Pentacles symbolizes that he is not getting involved in the drama of others. On the other hand, he hasn’t turned his back on the world either. Instead, he is focusing on his own progress – and those details that truly matter. When the Eight of Pentacles card appears in your tarot reading, you are reminded that life is a work in progress, so why not make it a work of art? Looking ahead, you see what needs to be done to make your life’s ambition a reality over time. Keeping the big picture in mind, you see no need for a frantic dash to the top. But you’re also too busy to waste your time with worry or displays of vanity. You’ve learned from past mistakes, and you have worked out your plan for success – down to the smallest detail. Knowing exactly where you’re headed, you are busy putting this plan into action. Oh, you could be doing better? Your gains are currently limited? When those catcallers tell you something you don’t know, you’ll start listening to them. In the meantime, you are making your life better, one success story at a time. Your keen eye for detail and your focus on perfection have made you skilled in just about everything you do. If you are job hunting, the energy is right to ask for that interview. You’ve done your homework, and you know how to convince a prospective employer that you are the best candidate. If you’ve set your eye on that promotion at work, your superior has followed your progress for a while. It won’t take much convincing for him or her to agree that it’s time for the next step up. If you are working in a creative field, you are getting attention from the right people. It may still be a few years until your bestselling novel or charts topping hit. But you’re okay with that. What’s important is that your gigs now do more than just pay the bills. And looking at the next few months, your schedule is filling up quite nicely. Did someone steal your mojo? When reversed, the Eight of Pentacles points out distractions or blocks in your energy flow. They leave you feeling exhausted and restless. You’re annoyed about the lack of progress and at the same time, you’d rather be anywhere but here right now. The good news is that once you’ve figured out what’s keeping you from your goal, fixing the problem should be pretty simple. Virgo’s perfectionism can be a major distraction. Looking for ways to improve your life is a good quality. But it’s easy to lose your way, if you can’t see the forest for all the trees. Are you falling behind because you are micromanaging everything? Are you too impatient with yourself and others? When reversed, the Eight of Pentacles tarot card encourages you to keep the bigger picture in mind. Remember that life is a work in progress. You may feel that others are not giving you enough recognition for your efforts at work. Are you voicing your concerns or are you watching others get all the credit for your work without saying anything? True, sometimes life isn’t fair, but it’s not always unfair. Knowing the difference in this situation will help you determine the best course of action. But whatever you do, sitting in a corner and quietly grumbling that there’s no justice in the world won’t to a thing to improve your lot. While distractions and frustration dissipate your energy, pushing yourself too hard can block it. Those energy blocks are just like painful leg cramps you get after you exercised too hard at the gym. That’s your body telling you to chill out. If you’ve been focusing too hard on your job or business, you mind will do the exact thing. You can only skip your breaks and lunches for so long until your mind goes on strike, demanding some “me-time.” Take mini-breaks to meditate or go for a short walk. That will do wonders for your morale – and your productivity. Kabbalistically, eights are associated with Mercury, and that’s always good news in business and personal interactions of any kind. In this card, Mercuryhelps you focus on the right details and the best way to get your message across. In traditional Numerology, 8 corresponds to Saturn, the creator/destroyer. To make lasting improvements, you are shedding old ways of thinking that have been holding you back.